This probably isn’t a complete list of the cameras I have owned. I haven’t mentioned the Minolta 16mm I got from Ernst (I don’t believe I’ve ever run film through it), or the Agfa compact I got as a bonus at the Hunt photo show, for example. Took 127 roll film, a size smaller than 120 (made “4×4″ pictures, 1 5/8″ x 1 5/8”). Had a built-in flash attachment that took AG1B bulbs (the “b” is for “blue”, daylight-balanced, bulbs). I think the only thing the batteries in the camera were used for was to trigger the flash. This was a Sears Tower camera (I don’t know who actually made it). I got mine around 1960 (possibly as late as 1962, but I think earlier), and I took this camera to Africa and through Europe in 1964. I got this from one of my grandparents. This one took 116 roll film (which is wider than 120). I never used it that much, and I have no idea what happened to it. Maybe it was a Bolsey B2. I don’t still have it, and don’t really have pictures of it. The B22 had the flash exposure sync, which mine didn’t. 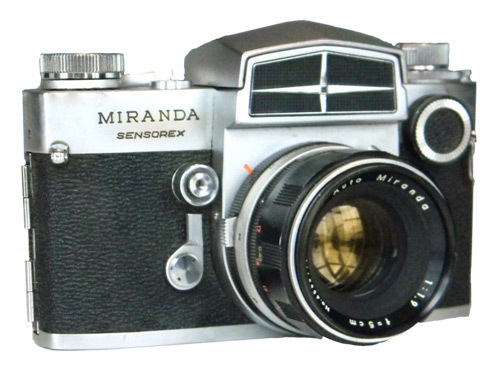 I got this as a hand-me-down from my mother, after she upgraded to the Minolta rangefinder for the 1964 summer trip to Africa. In fact, I think I left it with her, and she disposed of it at some point, which is why I don’t have it now. That case really was that color. 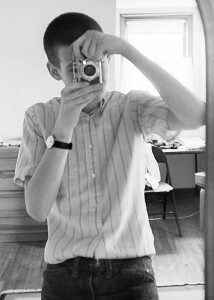 Hey, I just found a semi-decent picture of me with the Bolsey (probably 1968-69)! This is in a mirror, of course; I’ve left it mirror-image. I bought this at Century Camera, a pro store in Minneapolis (associated with the Color By Century pro lab, too). I picked it because it (and the 50/1.4 lens) got the best rating from Consumer Reports. One of the things I learned from this is that a consumer magazine is not the best source of information on specialist equipment. 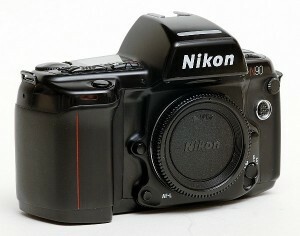 It cost $280 with the 50/1.4 lens. I later got a Soligor 200/3.5 lens, and then a 28mm. 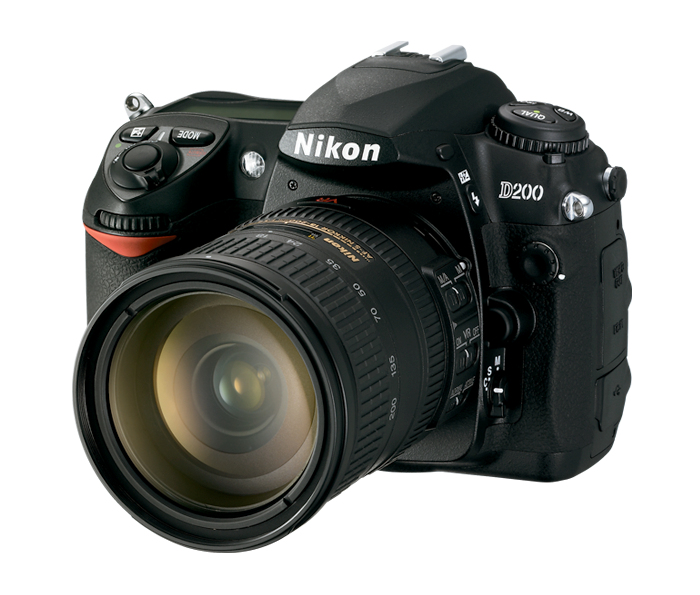 I liked the 200 a lot, but never did really bond with the 28mm. This camera had a number of unusual features. The metering pattern was bottom-weighted, which worked well for landscapes but had to be compensated for in verticals. 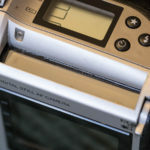 The metering element was on the mirror, not in the viewfinder, so all the viewfinders provided metering. 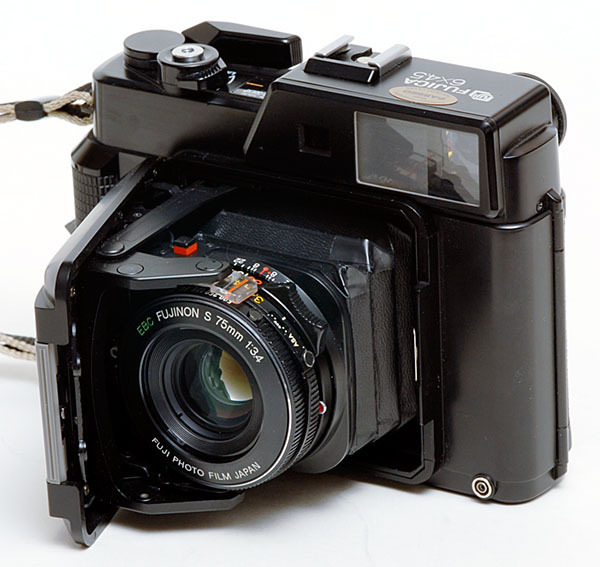 The shutter release was on the front of the camera rather than the top, making verticals much more stable to hold. You had to manually set the lens maximum aperture on a control dial, it wasn’t communicated by the lens mount. Hans Muessig at Carleton convinced me to try this, and it was a hit. 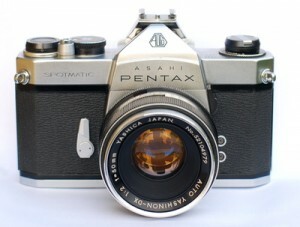 I got a used one via Hans (from his favorite store out in California), with the 50/2 collapsible lens, for $250 in about 1973. I soon added the 90/2 and in 1975 the 35/2 lenses, which I also liked a lot. The fast portrait-length tele was especially nice. Mine was an earlier double-stroke body (I believe I once looked up the serial number and determined it was just about the same age I was). 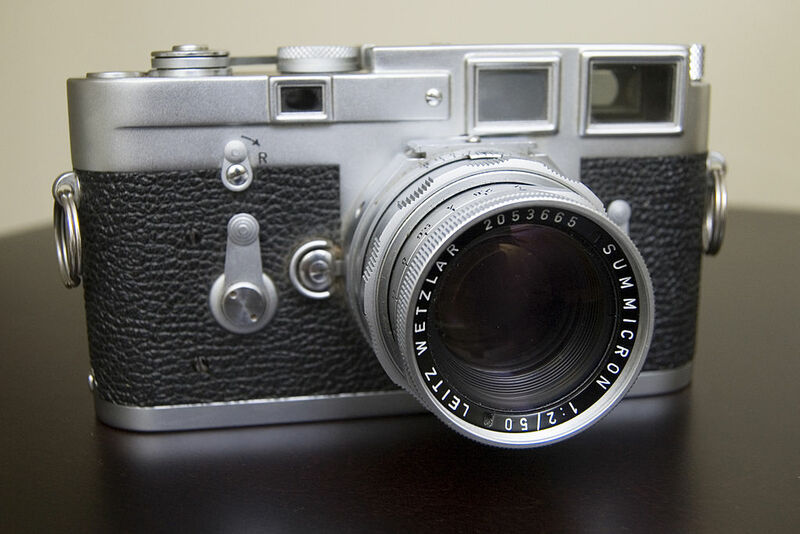 I needed something to go with the M3, to support closer focus and more extreme lenses, and bought this from another Carleton student, maybe Marshall Gittler. It came with 28mm to 400mm lenses, and my first “automatic” flash. Or maybe I traded the Sensorex for it? I don’t remember selling that separately. Don’t remember which model. Used for snapshots, including for Dean and Kathy’s wedding out in California (didn’t bring the big cameras because I was best man and had duties). I got this used from the guy who ran Williams Photography when he upgraded to Hasselblads for his wedding work, and it was a very nice camera for me. I used it for portraits and landscapes both. I don’t remember what ever became of it; maybe it was part of the collection stolen from Finagle’s Freehold. After all the camera gear was stolen from Finagles, I let things sit for a while. 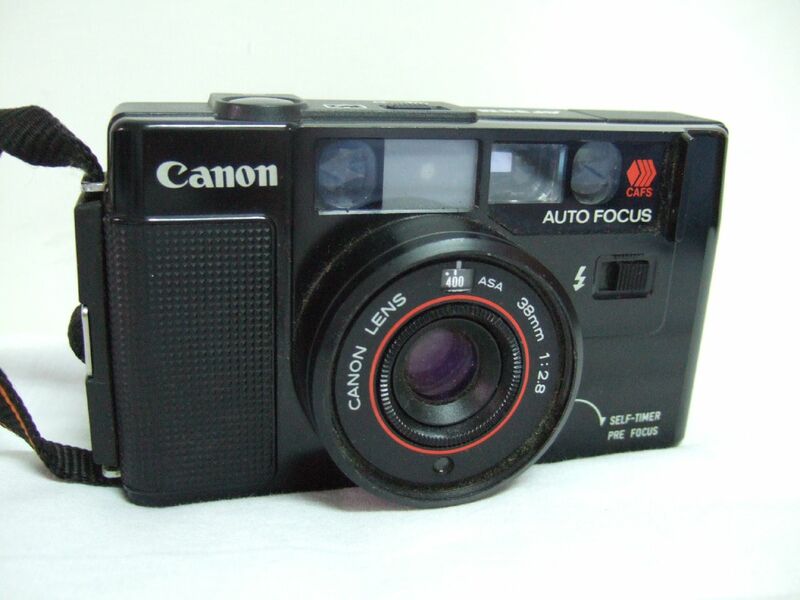 Then I got one of the new breed of auto-focus snapshot cameras (successors to the classic Canonet QL17 and Olympus 35RC). With color negative film this took remarkably good pictures. There’s still a historical page for this at Canon. 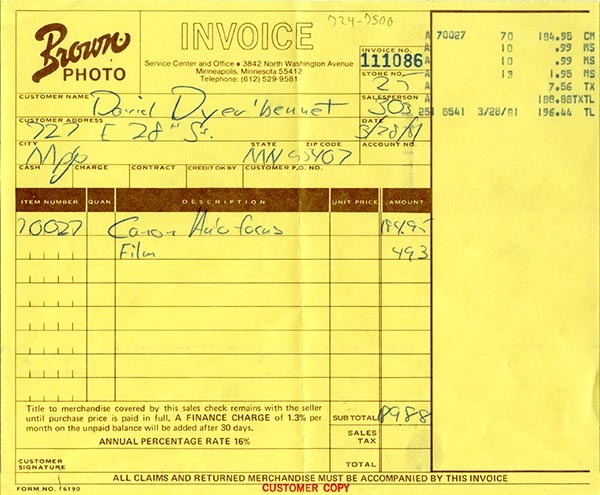 Since I found the receipt, I know I bought it 3/28/1981, Brown Photo downtown. 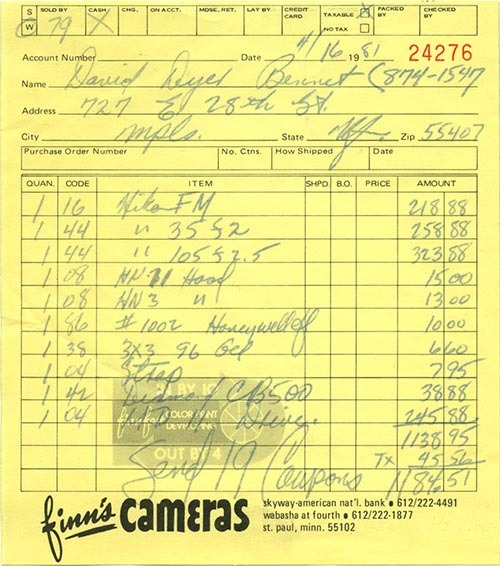 But I couldn’t stay out of photography, so before Minicon in 1981 I went over to Finn’s Camera in St. Paul and bought an FM, the MD12 winder, and 35/2 and 105/2.5 lenses (the MD12 kept the wind lever out of my eye; I’m left-eyed). The 105/2.5 never really worked for me. I wish I’d known about the 85/2. I got these 4/16/1981, along with a little tiny Honeywell flash and a heavy neutral-density filter, which I never did manage to use for fill-flash in low-light situations. This is my FM, or at least one of them (I bought some other used ones later, not detailed here). Added as a second body in 1982. First time I’ve ever had two bodies taking the same lenses. 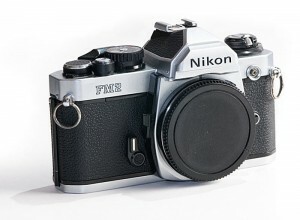 Useful for color and B&W film, or for quick access to two lenses. Nikon quickly came out with an FM2n, which raised the flash sync speed to 1/250, so I bought at the wrong place on the curve slightly. Bought from B&H in the early 1980s to learn 4×5. 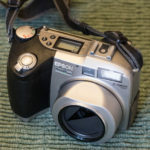 Made very little use of it, the best probably being the March 2001 pool party portrait session, where I shot a lot of 4×5. A replacement for the Canon Sureshot, which was never actually as good. Not sure why I thought I needed to replace the Canon. 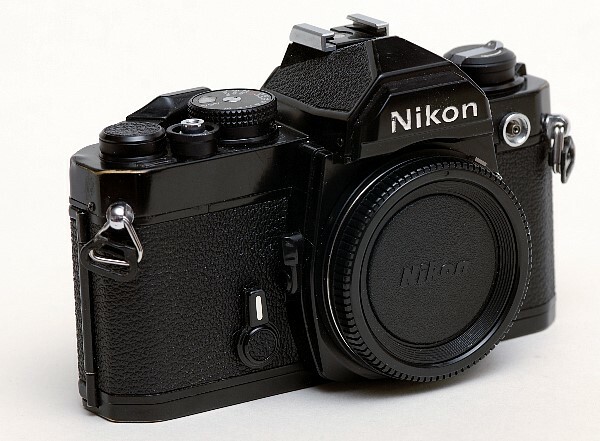 Nikon wasn’t providing spot metering in the cameras I used. I converted to Olympus to get that in 1987 (having missed the oncoming importance of autofocus; at that stage it was a consumer feature, and had tempted Canon into insanity, completely orphaning their existing user base). I carried two of these through the six-week trip to England in 1987 (starting with the Worldcon), and took them back in 1991. The 24mm shift lens was very useful for castles and cathedrals, which the silly people had built in the middle of towns where you couldn’t get back far enough to photograph them properly. When I figured out I needed autofocus in 1994, I went back to Nikon (still having some of the old gear, and Nikon AF being forward and backwards compatible with their old system, unlike Canon). I ended up buying this from a west coast camera store rather than B&H, because I let my schedule slip too far and ran into one of their Jewish holiday closings. The photo is actually my N90, when it was old. This was such a great idea. 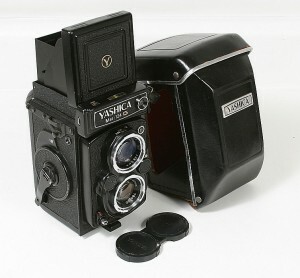 A folder, shooting 120 or 220 film in 6×4.5 format. It even had a light meter. 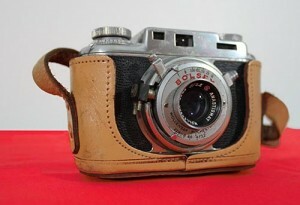 It was about the size of a 35mm body when folded. 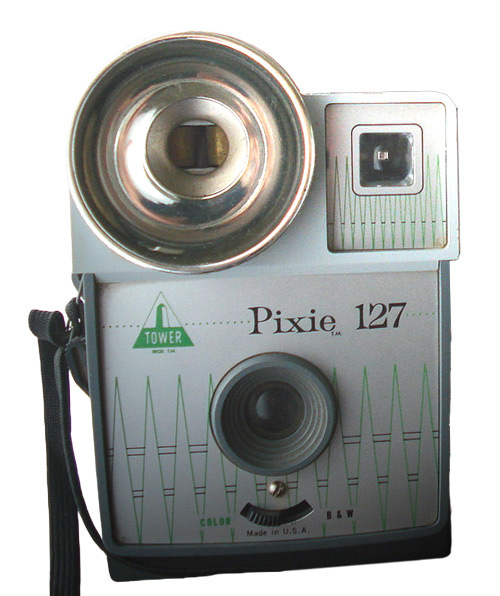 But mine consistently got pinholes in the bellows, with the result that it ruined more photos than it captured. It was a great disappointment. 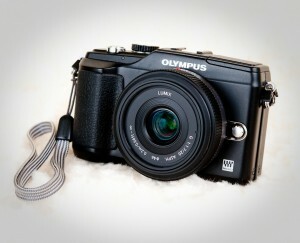 The photo is my camera. 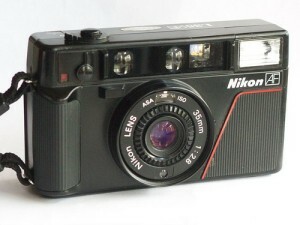 My first digital, bought in the spring of 2000, and taken on the Pittsburgh trip. 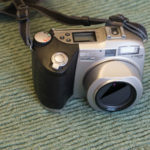 This was a 2 megapixel digital, with no RAW output. Still immensely exciting. I did switch to doing most of my photos with this during that period. When I moved on the the Fuji S2, this went to Pamela, and eventually died on her. Here are photos of my actual camera, just before sending it off to the Minicon Rumpus Room to be disassembled for the amusement of children. 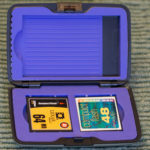 48 and 64 megabyte compact flash cards I used with the Epson 850Z, in a hardshell case that also held a full-size flash card. The screen could be lit by battery power, or by ambient light if it was bright out. This shows the door for that closed. 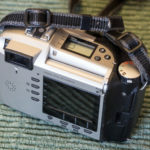 My first DSLR, delivered 31-Dec-2002. Used my Nikon lenses, AF and regular. 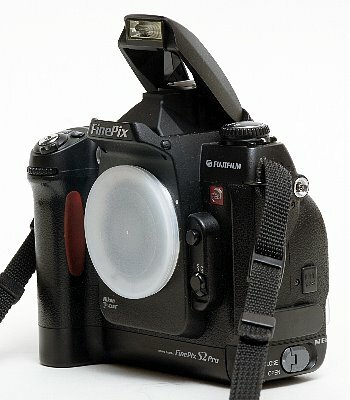 Still used the old TTL flash system—which didn’t work with the digital sensor (wrong reflectivity, not like film). This had a weird power system, using 4 AA cells AND some weird new battery (CR123 or something). Turns out that leaving out the weird battery just disabled the flash. I ran it that way most of the time, because that made my battery management a lot simpler. 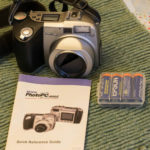 I really miss being able to use standard batteries in my cameras. 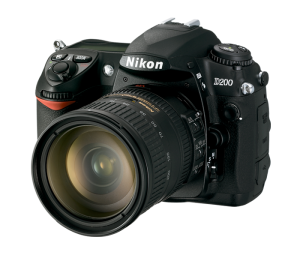 I sold it when I upgraded to a D200. Modern, very small, camera, with decent high ISO performance for the generation. 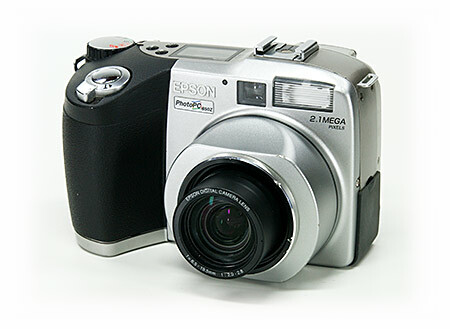 I think this was my first video-capable camera, too. This model wasn’t sold in the US, and was followed up fairly soon by the much better FD30, so my timing was off. It also took an expensive rare memory card format. Upgrading to this got me better AF, and a working TTL flash again (I bought an SB-800). The TTL flash doesn’t work as well as it did in the N90 still, though. I couldn’t find them at the real camera stores, but Best Buy had them in stock at a good price, so I ran out to a local store and bought it there. 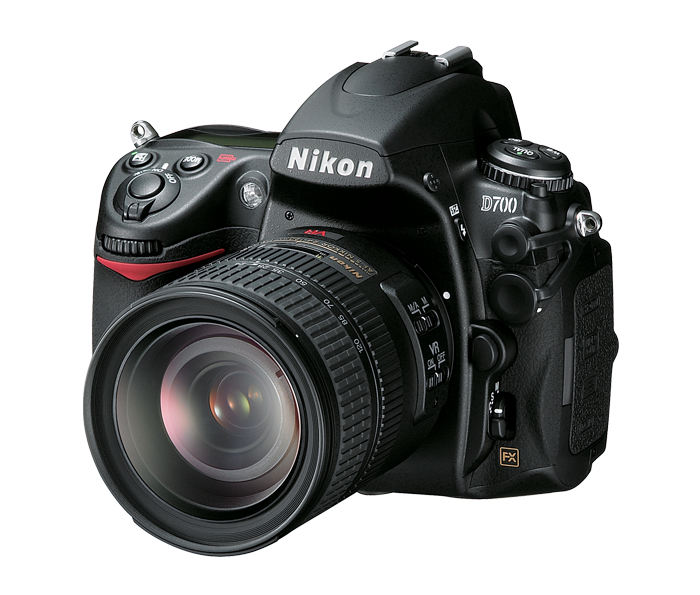 I kept it for a while after I got the D700, and it was very useful to have a DX for telephoto and an FX for low light. But I eventually sold the D200 for something over $600. I hadn’t expected to go back to full-frame size, so I had been optimizing my lens collection. But when this became available so cheap (a mere $3000 or some such), it was irresistible. 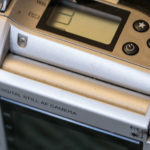 For me it had all the good points of the D3, and some additional benefits (built-in flash and CLS controller, and sensor cleaning) absent from the D3. It had the full AF system, and the full high ISO performance. It was, and still is, amazing. A very good P&S, but a bit large, and not actually that good in low light. 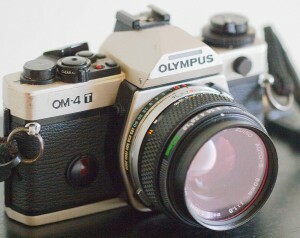 The 24mm (equivalent) wide end was very nice, and the fast f/2 lens was also. 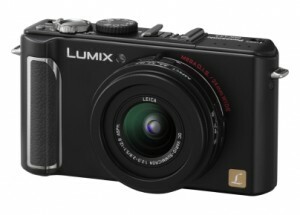 A Micro Four Thirds camera, which with the 20/1.7 pancake lens is about the same size as the LX3, but is MUCH better in low light. The 45/1.8 is spectacular, too, in that 85-90mm range I like so much (35mm-equivalent). 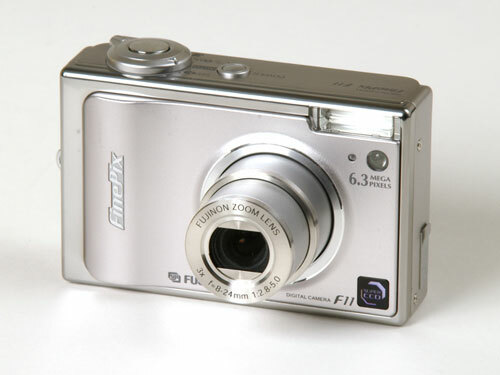 I used this camera for video a lot, in my earlier work with Corwin Brust on video projects. I eventually sold it to Felicia Herman shortly before Minicon in 2014. I also got the Lumix 14/2.5, Olympus 40-150, and Rokinon 7.5/3.5 fisheye for it. And adapters; the Nikon 85/1.8 makes quite a nice fast telephoto on Micro Four Thirds. I also played with a Cosmicar 75/1.4 c-mount video lens for it. 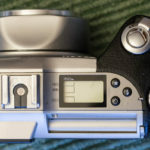 Possibly the worst-named camera ever sold! But a great one. 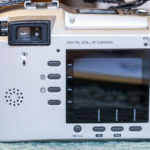 I got it used from KEH for $665 including the Really Right Stuff tripod interface plate. It’s nominally bigger than the EPL-2, but I can fit it in the same Crumpler “Four Million Dollar Home” bag with three lenses easily, so it’s small enough. 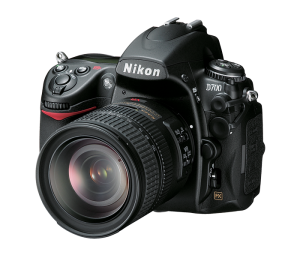 Has flaws for video, like no ability to adjust the exposure during a take (in manual exposure), and no focus aid in video manual focus. 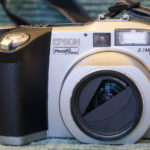 But the EVF is good (gives me a larger view for focusing than the LCD), and the tilting LCD is very good, and of course the image quality is extraordinary. Oh, also got me up to full 1080p. (Must remember to shoot a picture of mine to include here).